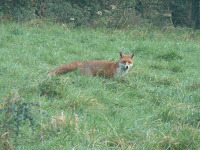 There was a fine-looking vixen in the field behind our cottage this morning, quartering the long grass slowly, listening attentively, occasionally performing great leaps onto scurrying things that it desired for its breakfast. On the subject of fauna, I carried in an armful of logs the other evening and thought that the sensation in my forearm was simply a sliver of bark. Depositing the wood in the basket by our woodburner, I discovered that it was, in fact, a wasp that had no doubt decided to select the wood pile for its winter withdrawal from active duty. It had stung me at least twice and my forearm now resembles a ham. It is also very itchy and smarts moderately intensely when scratched or exposed to hot water. Strong yellow in colour, with orange lights. Fine occasional bubble. After quite some breathing, it gave off rich notes of milky coffee, ginger spice and minerals, plus concentrated fruit aromas of star fruit, lemon and orange marmalade. Fresh mushroom skins. The palate was fine and acutely mineral. There's still a touch of austerity about this. Medium acidity and a fine bead. Nutty, with a good thrust of lemon fruit and freshness. The palate seems younger than the nose. It was 1990 Cristal and we drank it with home-made mushroom soup. We hosted a tasting later that day at the house of neighbours who had kindly gathered a group of friends for the occasion. We kicked off with our Prosecco and it was as well receved as ever. We've been selling masses of this wine and I suspect that we will continue to do so, as wine drinkers eschew champagne in these days of mournful news bulletins. We then poured, sniffed and sipped a range of liquids from our drinking list, including a number of new wines - the Alsace Riesling, the Morellino, the South African Sauvignon Blanc - as well as some old favourites: the Verdicchio and the Touraine Sauvignon. We also had a look at the 2005 Volnay from Rebourgeon-Mure, a wine that is showing superbly, but would, I believe, benefit from a year or two more in the cellar. I was very pleased that all wines were very well recieved, those garnering the highest praise being the Morellino, the Riesling and the Touraine Sauvignon. For my money the Riesling is a very senior wine indeed and I intend it to be a feature of our fridge over the Christmas period.